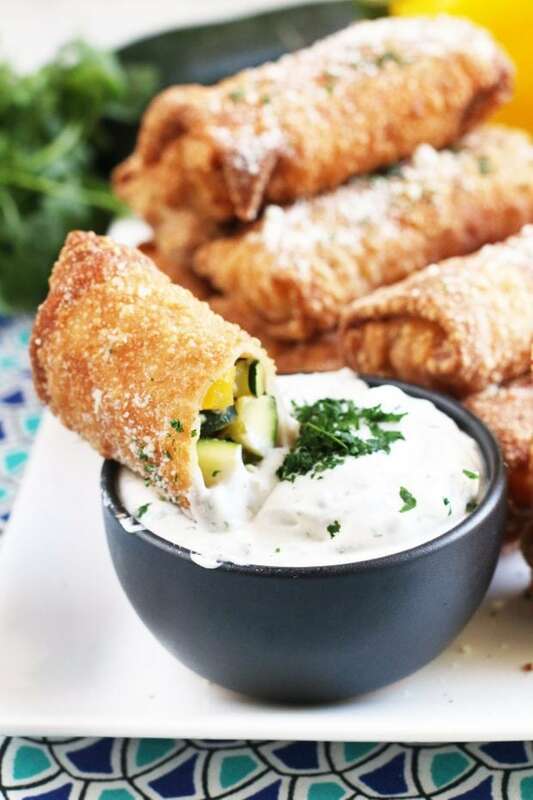 Grilled Vegetable Egg Rolls are the perfect summer appetizer to break out the grill for! 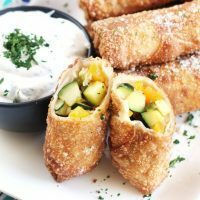 Hearty charred vegetables and a spice blend fill these golden fried egg rolls, making them a flavorful recipe that’s full of texture. You know what I just realized? This is the first time in a couple of years that I’ve had a patio of my very own to enjoy. Every time I sit down to write about something I grill or spending time on the back patio, I keep wondering why I am so obsessed with it. I find myself popping outside several times a day now just to sit in a lounge chair in the shade and watch the dogs run around while I answer emails or stare at the breeze running through the Aspen trees. The last couple of years, before the Man and I moved into our house, I didn’t really have a yard to retreat to. The patio at our townhome had ZERO shade so it was blazing hot in the summer, plus it was super tiny and I didn’t have a grill, so I didn’t ever have a reason to just sit out there and enjoy the space. For those of you wondering, no I couldn’t sit out there and get tan. I don’t tan. I turn pale, then sunburnt red, and then back to pale. So now I am in patio heaven and I am feeling the happiness of the summer outdoors coming back into my life a little more every single day. Thus the obsession with grilling and all the grilled recipes I keep throwing up on the blog! Having a grill and a yard to grill in has been something I’ve missed the past couple of years. Even when I had a grill all those years ago, I didn’t even use it that much. I don’t know what changed – maybe it was because I mastered the grill for the first time and am now feeling more confident? All I can say is that you really can always learn new things when it comes to cooking. 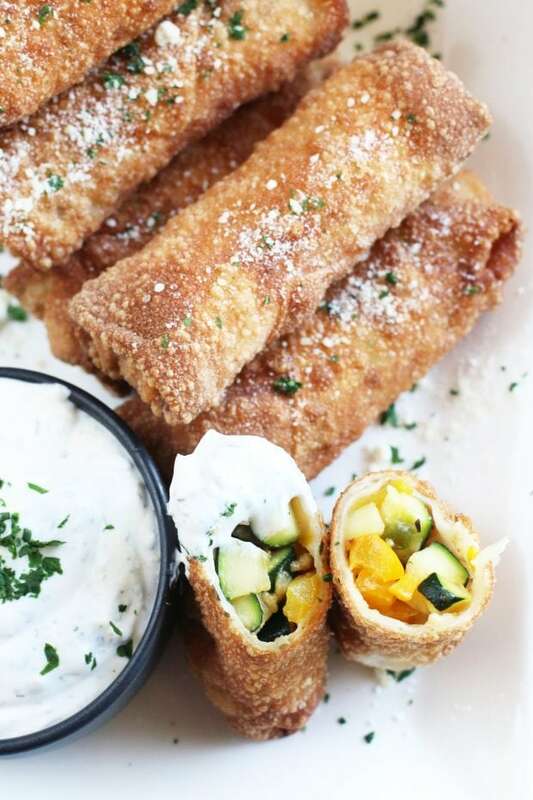 So, that’s a REALLY long way of saying that you need to make these grilled vegetable egg rolls. Grilling the vegetables until they are somewhat charred is key to this recipe. 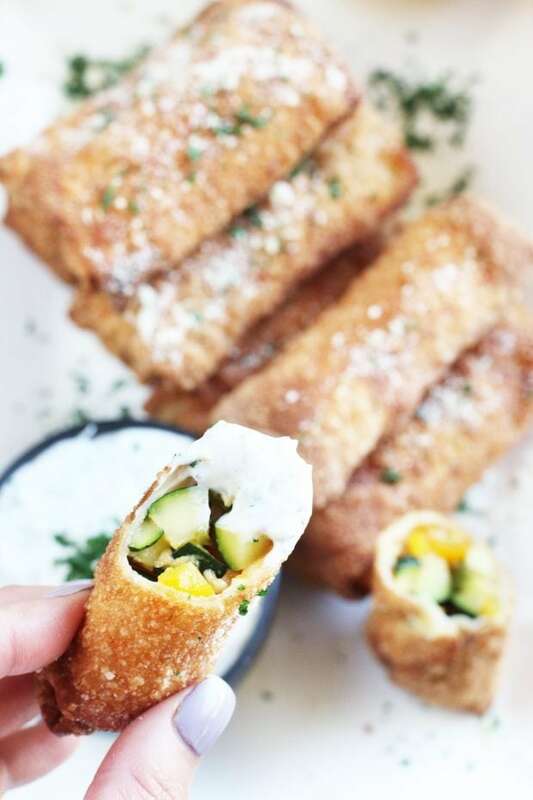 Getting that extra flavor from the grill is just what makes these egg rolls so incredibly flavorful. So it’s time to fire up the grill my friends! Get outside and make those summer memories count. 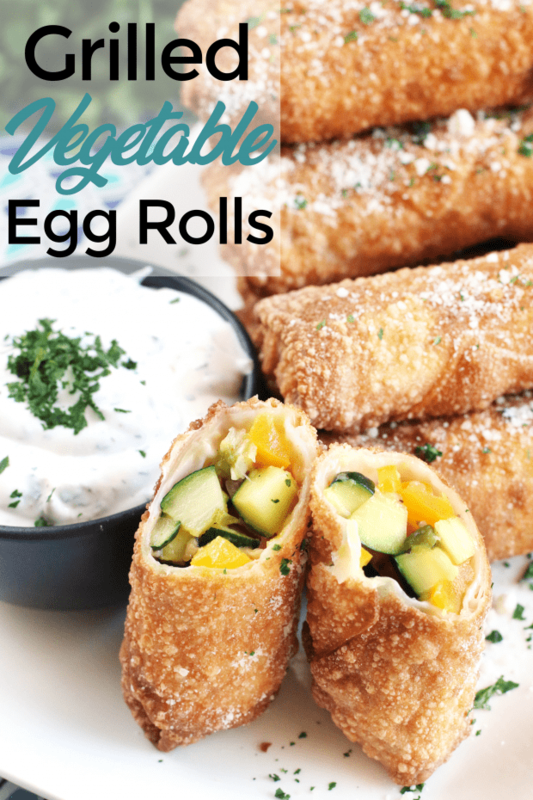 Pin this Grilled Vegetable Egg Rolls recipe for later! 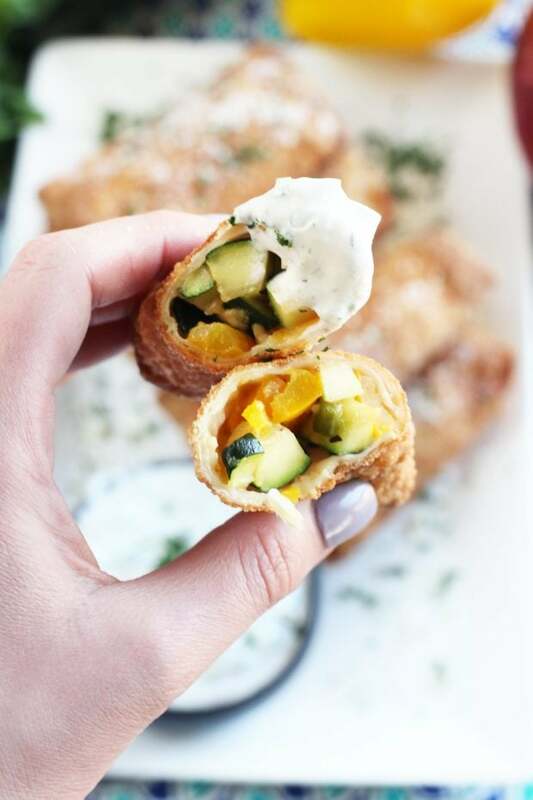 Make the most of summer with grilled vegetable stuffed into crispy egg roll wrappers and dipped into a creamy herb sauce. 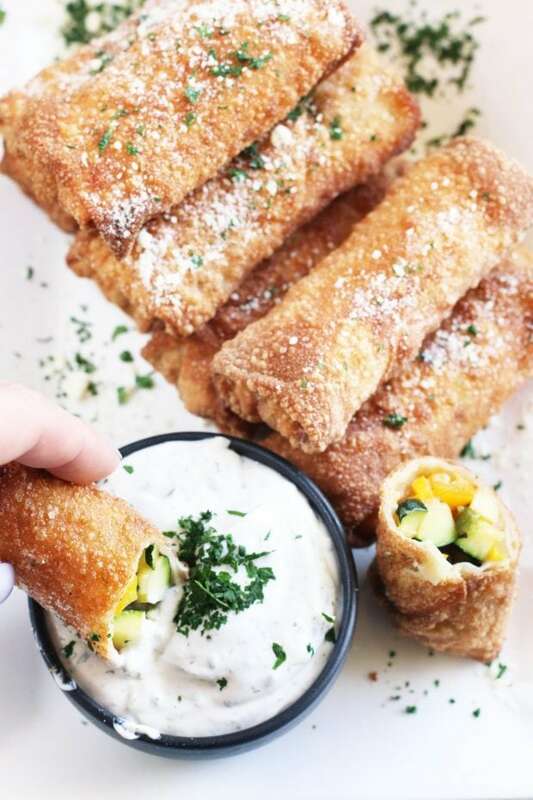 It's the perfect appetizer of the summer! Heat grill to high heat. Once hot, add bell pepper, zucchini, red onion and serrano peppers to the grill. Cook vegetables until slightly charred and cooked through, approximately 5 minutes per side. 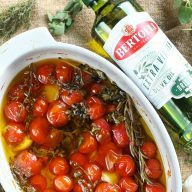 While the vegetables are grilling, add all ingredients for the creamy herb sauce. 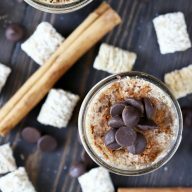 Whisk together and set in the refrigerator until ready to serve. Remove the vegetables from the grill and let cool slightly. Once cool enough to handle, chop the bell pepper, zucchini, red onion, and serrano peppers. If you don't like your egg rolls too spicy, be sure to remove the seeds inside of the serrano peppers. Add chopped vegetables to a bowl with the spices and cheese for the grilled vegetable filling. 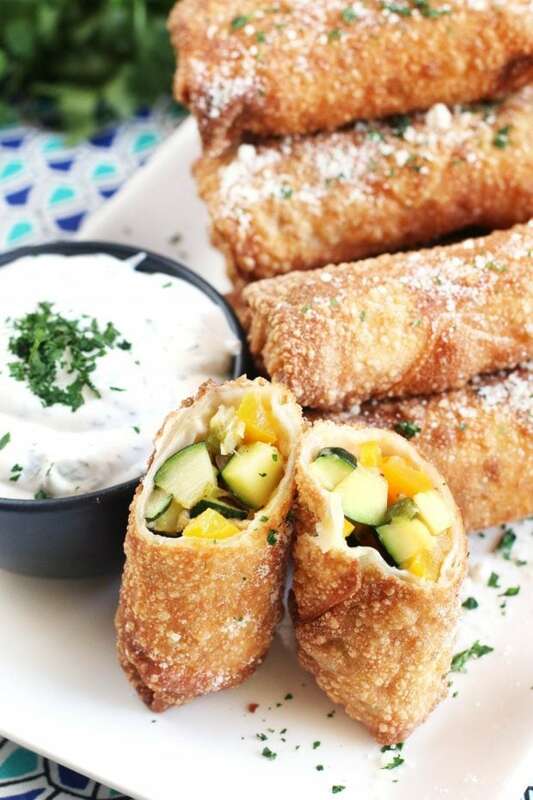 To wrap your egg rolls, start with a clean, flat surface. Lay one wrapper so one of the corners is facing you (like a diamond). Dip your fingers in the cornstarch water and spread on each edge of the egg roll wrapper. 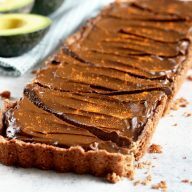 In the corner closest to you, spoon 1 ½ to 2Tbsp of the grilled vegetable filling into the center. Lift the bottom corner up and begin to roll away from you, making sure you tuck the corner under as you roll. Once you are halfway up the wrapper, fold in the left side and then the right side towards the center. Continue rolling away from you until only the final corner is ready to roll. Dip your fingers in the cornstarch and water mixture you made earlier and brush it over the final corner. Finish the roll, brush a little more of the cornstarch mixture along the seam, and place seam-side down. Make sure you roll the egg rolls tightly. If they are too loose, they will fall apart when you fry them. To fry the egg rolls, fill a pot with 4-5 inches of cooking oil. Heat the oil to 350 degrees. Gently add the egg rolls to the hot oil, frying no more than 3 or 4 at a time, turning occasionally. 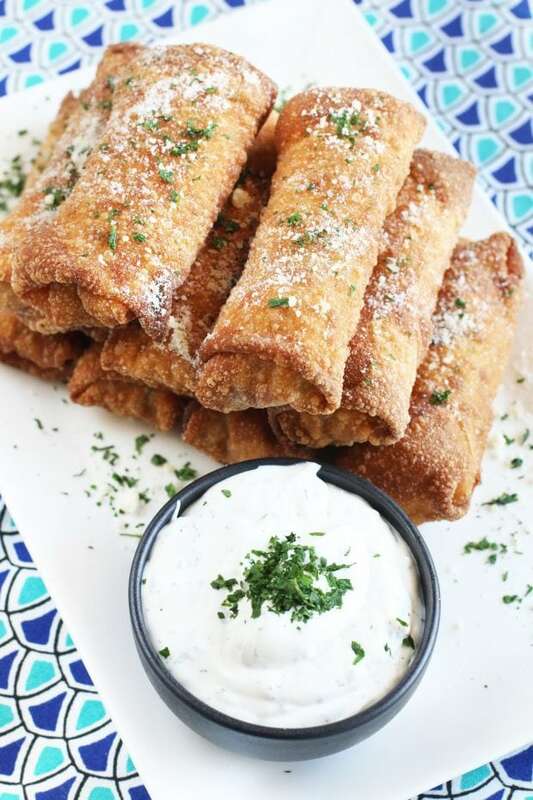 Fry until the egg rolls are golden brown on all sides, approximately 2 minutes. Place on paper towels to drain and cool. Serve immediately with creamy herb sauce.